Back in the spring of 1958, Hilde Hoegler, daughter of Alpine Club founder Wilhem Hoegler, invited approximately 20 cousins and friends to Onkel Joe Mausser’s “Bush” to discuss the forming of a Youth and Dance Group at the Alpine Club in Kitchener. After much enthusiastic input, they began meeting at the Alpine Club regularly on Sunday afternoons for “socials”, which included dancing to LP records, playing games, meeting new people, and making new (life-long) friends. Snacks and beverages were available, but NO alcohol was allowed. The numbers grew quickly, as word spread of the fun gatherings. Soon it became “the” destination for many German and English-speaking youth, because in those days even movie theaters were not open on Sundays. It was also a great opportunity for New Canadians, still arriving regularly by boat from Germany and Austria, to connect with our members. Soon a ping-pong table was added to the activities, generously and expertly crafted by Onkel Ernst, of Mausser Custom Furniture, so only the materials needed to be purchased. Later, he would also craft the MAYPOLE for the BANDELTANZ for the Dance Group which continues to be used today. This all made the Alpine Club an enjoyable and fun place for the younger crowd to mingle, not only at Saturday Night dances, but also participating in external group activities such as skating together at Victoria Park in downtown Kitchener. 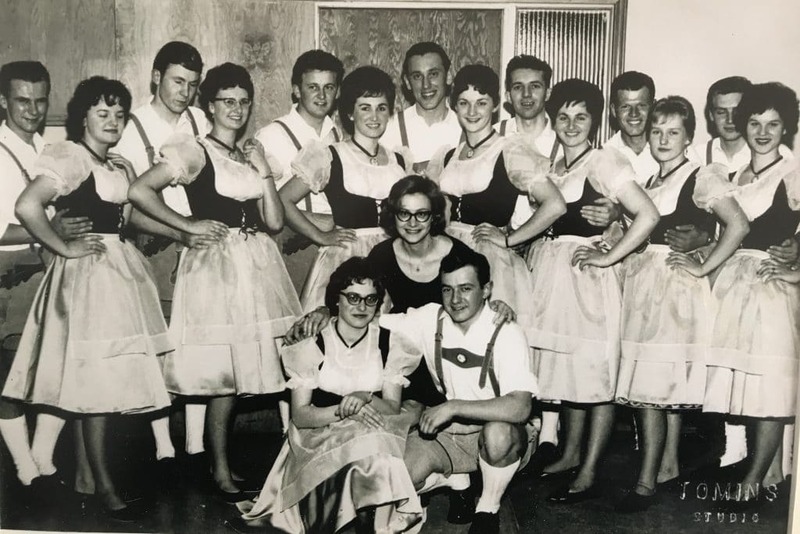 The youth group organized various dances throughout the year, such as Maskenball, Fruehlingsball, Oktoberfest Tanz etc., and always drew record crowds, often with standing room only. “Tombola” prizes were collected from local businesses in order to raise funds for the group. During the very early years, members were lucky to dance to lively music by Friedl Sigmund on the Button accordion and Alfons Hoegler on his accordion – who also had a good voice and always added in a few Yoddles for everyone’s enjoyment. Once the Alpine Club building was finished being built, members we were entertained by Willy and his “BLAUEN STERNE” and Joe Spitzel’s popular EDELWEIS BAND (which included Henry Vogel) for many years. Soon the idea originated from the band name, to hang blue stars from the ceiling and were fortunate to have Joe Eppich craft a die and cut hundreds of them so the many volunteers only needed to add sparkles. They were hung during one of the Sunday afternoon socials and all enjoyed “dancing under the stars” for years to come. It was soon time to form a new Dance group to take over from the original Alpine Dancers, which was formed soon after the club was founded in 1953, as many original members were getting married and starting families. Ridy, Hilde Hoegler’s older sister agreed to teach the dances they had been performing in her Dance Group, but brother Alfons Hoegler, their accompanist on the accordion was about to be married to Marianne Wingert, so the search was on for his replacement. Luckily there was more talent in the family, so younger sister Elfie and cousin Alfred Schleimer teamed up on their accordions to set the beat – to the delight of all audiences and guests. Lederhosen were ordered from Austria, and Louise Jacobi (an excellent local German seamstress) made all the pretty blue Dirndles with black velvet bodices. Crinolines were a must in those days to puff out the skirt and show off as the girls twirled. Even fancy bloomers were found at the Goudie Department Store. Needless to say, they were an instant hit! Six to eight couples usually danced at the Alpine Club, and other German Clubs in the KW area. Mr. Pritchard who owned a Travel Agency in town, invited the group to dance at one of his events after seeing them perform at the Concordia Club. The highlight for the group had to be the bus trip to the Cleveland Picnic in 1961, when the temperatures hit the mid 90’s! Great fun was had making more new friends and dancing up a storm to the older Gottscheer Zieharmonikas, despite the heat! This Alpine Dance Group existed from 1958 until the summer of 1962. For information on the current Alpine Dancers – please check out their page here.